Contains a wide range of content related to Mallorca: places of special interest, excursions, culture, gastronomy (recipes), local produce, leisure, sport, cycling, historical people, markets, fairs, festivals, fauna, flora, map of Mallorca, etc.In four languages: English, German, Spanish and Catalan. Issue No. 29. 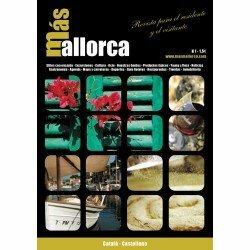 Contains a wide range of content related to Mallorca: places of special interest, excursions, culture, gastronomy (recipes), local produce, leisure, sport, cycling, historical people, markets, fairs, festivals, fauna, flora, map of Mallorca, etc.In four languages: English, German, Spanish and Catalan. Issue No. 1. Contains a wide range of content related to Mallorca: places of special interest, excursions, culture, gastronomy (recipes), local produce, leisure, sport, cycling, historical people, markets, fairs, festivals, fauna, flora, map of Mallorca, etc.In 2 languages: Spanish and Catalan.